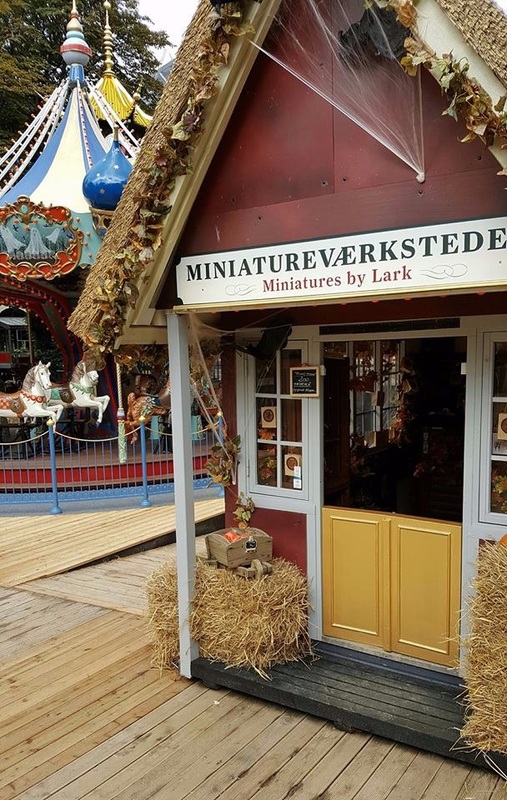 Next to the merry-go-round for small kids in front of the Pantomime Theatre you will find me working in my little atelier where my miniature art exhibition "Med lup og Blyant" is on the surfaces, which are not visible form the outside of the cottage and my paper art exhibition, "Blood Moon" takes place until Nov 5th 2017. It is 6 squaremetres, actually, I wanted a bigger cottage, because I don´t have room for all my arts and crafts media, but it is big enough for a quiet talk to me about my art, if you like. I am following the opening hours of Tivoli. I have all ready had visits from some of you who are staying at the Nimb Hotel and Hotel Mercur. Thank you very much, I hope you have a nice stay in Copenhagen and a great day in Tivoli. I myself at New year 2017 made myself the resolution that in 2017 I would only do things that make me happy, and believe me: This is place is a FUNNY place to work. Only glad people are coming here, people who are out to have a great day. Also, I find Tivoli very inspiring for my art. Every now and then I go for a walk in the old garden with my sketchpad or for inspiraton for my unique handcrafted witch tealight candle bags. If I am out, when you are visiting my little place, my husband, Bent, is helping me taking care of my very little gallery while I am away for a few minutes.